showing their different finishes (not all of them), but sufficient examples that basic differences are present for you to see. More importantly, for this writing, the photos show the different location of and examples of the engraving of these beautiful and streamline pistols – examples of the engraving type or style most frequently seen. reduced, he ventured into The New Model Pocket Revolver- the final Remington percussion revolver to leave his factory. Financial recovery was now in sight, somewhat. Oddly, and with questions unanswered, this revolver had a spur trigger, a feature not seen in Remington percussion handguns since the 3rd Model Beals Pocket Revolver of 1859-1860. To this day collectors have differing opinions why the gun departed from the round trigger guard to adapt a spur (or sheath) trigger. Remington now had three avenues to recapture a ranking position in the American firearms manufacturing business. The first was by adding the New Model Pocket Revolver to his catalog and list of available handguns for sale. The second avenue was to enter the British market in England, which he did, where there were dollars to be made due to a new interest in sporting rifles and shotguns. Thirdly then, was to show new products in his catalog. He did this by hiring competent gunsmiths and inventors who designed great small, cartridge handguns. 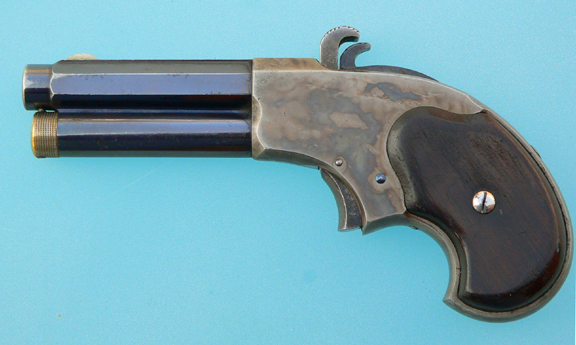 Remington already manufactured many of these which were very successful in the market place. Some were the Elliot 22 rim fire five shot derringer (sometimes called a pepperbox) and its cousin the .32 rim fire four shot derringer – both distinguished by their ring trigger. Then there were the .22 rimfire single shot Vest Pocket Pistols and their cousins the Split Breech single shot derringers of .30, .32, and .41 rim fire calibers. Not to be overlooked was the Elliot Single Shot Derringer of .41 rim fire caliber, often referred to as the Mississippi model. We speak of Joseph Rider’s Magazine Pistol. The first patent for this pistol was Patent #118,152 and was dated August 15, 1871. 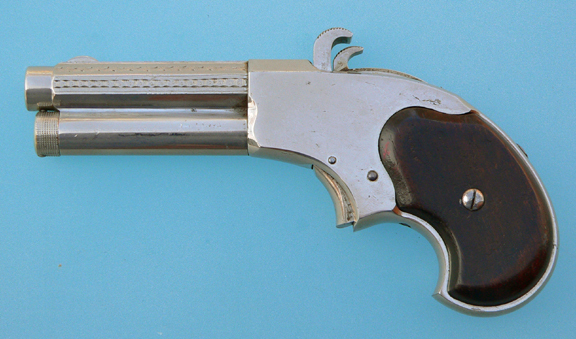 It included a description of a tube loaded derringer that held six 30 caliber extra short rim fire cartridges in its tube magazine which was found under its barrel. It has been called one of the most unusual Rider pocket pistol inventions in the nineteenth century. Our Winchester collector friends get a wee bit disturbed when Remington collectors tease them, saying that is the forerunner of Oliver Winchester’s tube load lever action rifles – good humor perhaps, but inaccurate. 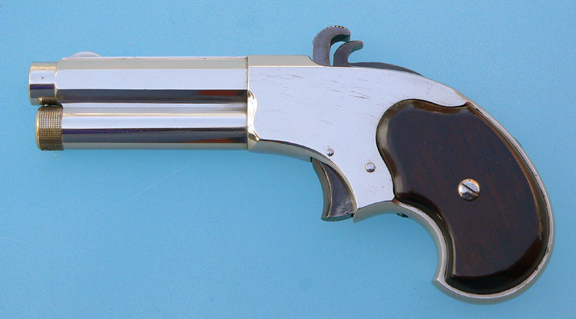 Indeed it was one of the first metallic cartridge pistols that used a tubular magazine. Also to be remembered was the Elliot line of double (over/under) two shot, .41 caliber rim fire derringers. This is Remington’s only gun w(th superposed barrels. Though the foregoing small pistols may be but a sample of Remington’s great handguns, they lead us to another of Remington’s very successful multi shot derringer-type pistols, the Remington Rider’s Patent Magazine Pistol. The Magazine Pistol, with its readily recognizable profile, is easy to identify with its tube magazine, part of and underneath its octagon- shaped barrel. 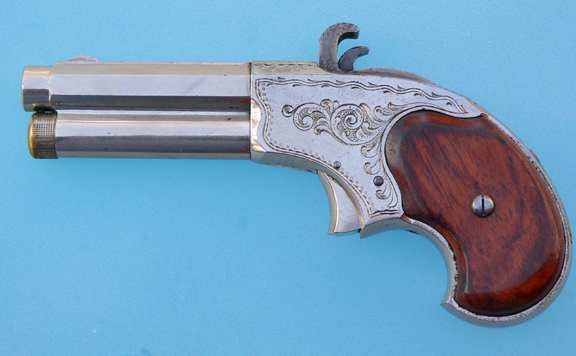 The finish of these small pistols is usually nickel plated, but not always as we shall notice from the accompanying photographs. More frequently than not we see the plain, nickel – plated guns with no engraving. Though less abundant than the engraved guns, price was about the same, baring a few exceptions. Other finishes include silver plated barrel and tube and gold washed frame, which was special ordered at additional cost to the buyer. Two extremely scarce finishes are the blue overall finish, and the blue barrel and tube with the frame case colored -the goddess of Remington beauty. The all blue specimen usually is found with prolific scroll engraving. Fire blue hammers and breechblocks are common as are screws, but not always. Screws are also seen in nickel plate. Grips of these guns are made of several different materials: all metal (rare), walnut, rosewood, ivory, and mother of pearl. The engraving of these guns can be sparse on the frame with no engraving on the barrel or tube. They can be found with frames prolifically engraved and with barrels engraved with modest design on the two flats to the left and to the right of the top flat. The profuse frame engraving was usually with large scrolls and other graceful embellishment. The sparsely engraved frames showed a smaller scroll with less embellishment, and, with no barrel engraving. These descriptions may be incomplete because just as soon as a collector, in his research, feels he has seen all Magazine Pistol decor, a different example most likely will emerge. You will note that the photos of the various examples show some of the various finishes, grip material, and engraving patterns. Over forty plus years 1 thought I had seen every example of Remington’s finish, grips and engraving on its Magazine Pistols. That is until February 2005, at which time I stumbled into a totally plain gun – no engraving – except for extremely minor engraving (if you wish to describe it as such), with very subtle patterns on each of the two barrel flats on either side of the top barrel flat. 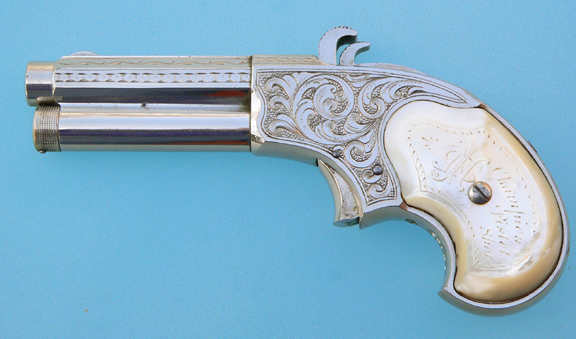 The photo clearly reveals this very delicate style of engraving, which I presume makes the particular Magazine Pistol one-of-a-kind: unique (9). You will note from the final photograph what I consider the most rare of the Magazine Pistols. 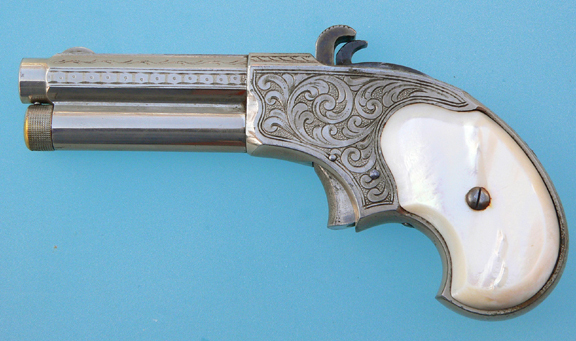 In fact, the location and style of the decor of this pistol leads me to my belief that it is one-of-a-kind. Never in sixty-two years have I seen a duplicate. The photo shows only a plain frame, minus any and all decoration. The tube shows no engraving. Eureka! Only the barrel shows decoration and that only on each of the two, barrel flats on the left and the two flats on the right of the top flat. The uppermost flats show a zigzag pattern surrounded by what slightly resembles a pattern of quarter moon design. The remaining two flats show a pattern of a modified rectangular design with a center dot in each. My exhaustive search for photos of a similar pistol was not with success. Likewise the written word in all available sources of Remington information revealed nothing helpful. Somewhere out there, we can be assured more information is lurking, awaiting someone with more patience than I. Could that person be you? This, however, ends my search, but my findings are not the final word, only an encouragement to others to seek additional nuggets of Remington knowledge. I am confident one specimen and perhaps more will turn up with engraving only on its barrel. In conclusion, there may be additional specimens of the Magazine Pistol out there, showing decoration only on its barrel and none elsewhere on the gun. It is my privilege to share with you the information of the one that I own. It is the one, and only one, I have ever seen. Perhaps, just perhaps, it is unique; but maybe you own one just like it.